Review Ultrazyme Universal Have used this for years and its a very good product. I am very satisfied with the price too as it is much cheaper with Visiondirect. One of the most troublesome problems for contact lens wearers is keeping the surface of your lenses free from proteins which naturally build up during everyday wear. Removal of proteins has been tough in the past, but is far easier thanks to Ultrazyme Universal from vision experts AMO. Using advanced cleaning products, lenses are bathed in this powerful but gently acting solution, restoring optimum vision and ensuring that contacts last far longer. • Ultrazyme Universal comes in tablet form which is dissolved in cleaning solution. This acts upon lenses in the normal way, scrubbing them thoroughly clean of any protein deposits. 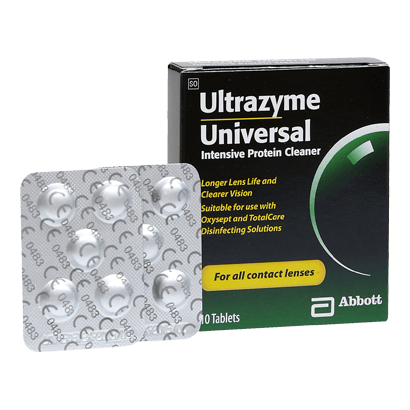 • To achieve the very best results with Ultrazyme Universal, add it to contact lens cleaning solution more than once a week. • Combine with AMO's Easy Rub, Total Care or Oxysept 1Step for even better cleaning results. • Comes in packs which contain 10 of the little Ultrazyme tablets. This should be enough for over two months of regular, effective usage. • Backs up and enhances the action of your normal cleaner for a new quality of vision and comfort. Ultrazyme Universal is one of a new generation of contact lens cleaning products. Giving normal lens cleaning products a leg-up, it focuses on one of the most pressing problems faced by lens wearers - proteins - and will make them a thing of the past.